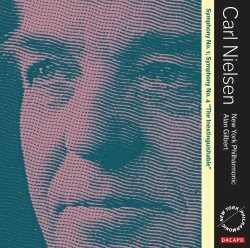 This eagerly-awaited follow-up to Alan Gilbert and the NYP’s Nielsen 2 and 3 (review) comes several months after Sakari Oramo and the Royal Stockholm Philharmonic’s inaugural recording of Nos. 4 and 5 for BIS (review). The former impressed me a great deal, not least for its unflinching character, incisive playing and fine – if somewhat dry - sonics. The latter has its strengths but it's otherwise generalised and remote at times; that's not what I look for in these symphonies. While Oramo’s band is a fine one it’s no match for the NYP. Also, there’s some tough competition from the likes of Ole Schmidt (Regis), Jukka-Pekka Saraste (Elatus, Finlandia), Herbert Blomstedt (Decca) and Michael Schønwandt (originally on Dacapo but now on Naxos). Of varying vintages all are recorded in very decent sound. Gilbert starts with the war-time Fourth, which ought to benefit most from his crisp, no-nonsense approach to Nielsen. The opening movement, with its threatening timps, is as terrifying as it gets, although some may find the balances aren’t entirely natural. The upside is that we’re presented with a close, full-bodied sound whose formidable heft and mighty terraced brass have seldom been so well caught. I was struck by Gilbert’s vice-like control of the proceedings, which has its downside. Indeed, he concentrates far too much on the score's emotive peaks at the expense of its reflective and substantial subtext. The almost chamber-like writing of the second movement is enhanced by a recording of startling fidelity and presence. Timbres are true and instrumental strands catch the light like gold threads in a rich tapestry. Dacapo have a well-deserved reputation for good engineering, and this DXD recording is undoubtedly bold and exciting. As before the balances in the Poco adagio quasi andante tend to favour the timps - the massed strings are comparatively recessed – but such is the intense heat of this live performance that few would have the temerity to complain. And when Gilbert does focus on the quieter music he imbues it with an extra beauty and security of line. As for the NYP their unanimity of attack and corporate sheen are frankly intimidating; in that respect they sound a lot like the Lucerne Festival Orchestra in full cry. Goodness, this is a scruff-grabbing performance. Given these exaggerated balances the agitated finale with its duelling timps is more full-on than usual; indeed, it’s overpowering, and not in a good way. At this point I began to resist Gilbert’s unremitting way with this score. True, it’s a volatile piece, but as Blake would have it: ‘Without contraries is no progression.’ And that’s precisely the problem here, there’s not enough light and shade, not enough space to rest and recover. Sampling both Schønwandt and Saraste is instructive, for there’s far greater variety and interest in both. As recordings they are more believably balanced, and as performances they bring out the inner vagaries and vacillations that help to humanise this symphony. Gilbert’s Fourth emerges white-hot from the crucible as it were, and I suspect it made a powerful impression in the hall. However, there’s far more to the symphony than this conductor would have us believe. I just wish he weren’t so severe, so unyielding. After that I was grateful to revisit Saraste, whose Finnish band play their hearts out for him. More important, I was reminded that even in this most eruptive of works there’s so much to beguile the ear and batter the heart. In short, Saraste tugs and touches the listener in ways that Gilbert simply can’t manage. Not surprisingly, perhaps, I approached Gilbert’s First with some trepidation. A youthful work, Nielsen’s Op. 7 can sound a tad bluff and rhetorical, especially in the first movement. Most conductors manage a degree of transparency here, but Gilbert remains infuriatingly opaque. It isn't all his fault though, for the playing is several notches below what we heard in the Fourth; not only that, the dry-as-dust recording lacks that alluring focus and detail. All these factors conspire to produce a very dull First indeed, and that’s even before we’ve addressed the woeful shortage of incident and insight. To ensure I wasn’t being too harsh I sampled Saraste, Schønwandt and – my wild card – André Previn and the LSO. The latter, a ‘needle drop’ from HDTT, has a lift, a joie de vivre, that eludes the unsmiling Gilbert. That point is driven home – quite literally - by the delightful tune that flits, Ariel-like, through the Allegro comodo. Saraste is particularly spontaneous here. Alas, things don’t improve in Gilbert's dogged finale, which lacks all cohesion and purpose. Clearly the electric atmosphere that accompanied the Fourth has dissipated, and what we’re left with is a very forgettable First. I sense that Gilbert sees himself as an iconoclast, which is no bad thing, but these two performances underline the risks of such a strategy. Leonard Bernstein had the chutzpah to carry it off, although many of his later performances - live and on record - were controversial to say the least. That's not to suggest Gilbert always gets it wrong; indeed, his Stockholm Mahler 9th is one of the finest I've heard in recent years (review). Even more surprising was his Mahler 3 at the 2014 BBC Proms; the first movement in particular - more Struwwelpeter than Pan - was most refreshing. More important it worked, despite slowish tempi and some unexpected gear changes. In the Mahler 9 review I hailed Gilbert as a 'first-rate conductor from whom we can expect great things'. In this case, though, his more traditional rivals are much to be preferred, both in terms of performance and their 'real-world' sonics. As a fan of high-res audio I know it’s all too easy to be seduced by show-off engineering; Gilbert's Fourth probably belongs in that category, although the effect is ameliorated to some extent by the unique frisson of that live occasion. As you will have gathered Gilbert’s First has no redeeming features at all. An overheated Fourth and a tepid First; not Gilbert at his best.